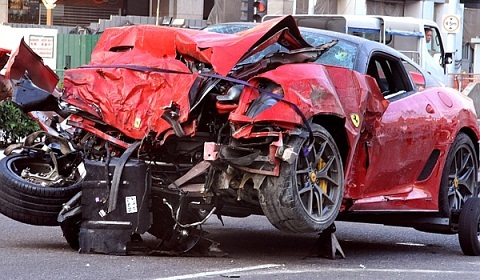 A terrible crash involving a limited Ferrari 599 GTO took place in Singapore. The 31 years old driver of the GTO was speeding in the city and tried to drive through a red light intersection at 200km/h, causing a fatal collision by hitting a motorcycle and a taxi. The result of this accident is devatasting as you can see in the pictures below; the drivers of the taxi and GTO are both killed, brain dead for the passenger of the taxi and serious injuries to the spine of the biker. A dashboard camera has caught the fatal accident that really leaves speachless by its brutality. 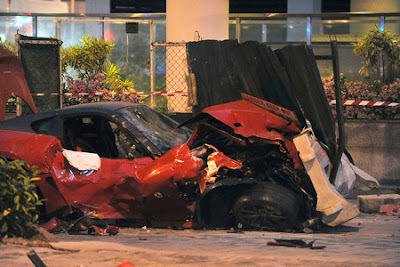 Wow that was fast A singapore Ferrari Car Crash ended here so fast intersting.